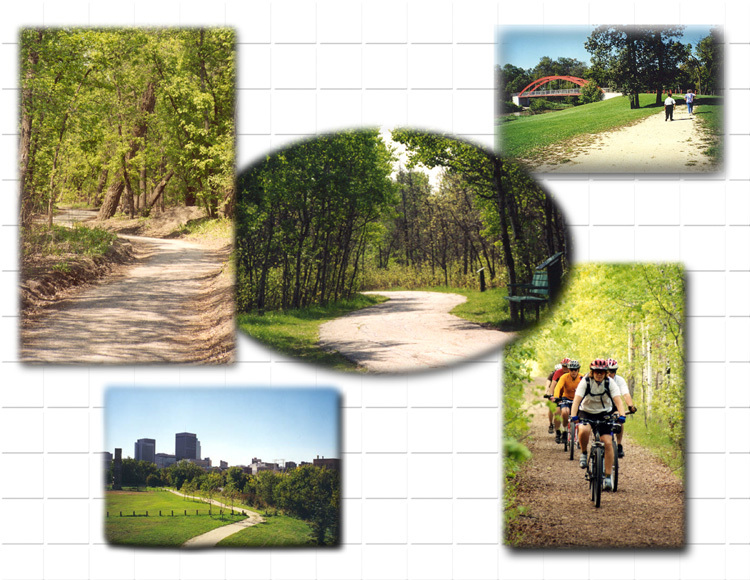 For scenic walks in a natural setting, check out the many trails and pathways in Winnipeg parks. The locations listed below offer trails and pathways for activities, such as walking, bike riding and rollerblading. For additional locations and information, take a look at our Naturalist Services web site. Assiniboine Forest is a large forest running south of Corydon Ave, north of Wilkes Ave, west of Shaftesbury and east of Chalfont Rd. Kildonan Park runs along the Red River and is located at 2015 Main St.
Little Mountain Park is west of Brookside Blvd. and Jefferson Ave. Waterfront Drive has pathways that run from Provencher to Higgins Ave. The City of Winnipeg's program for summer Sunday/Holiday Bicycle Route Street Restrictions are in place on Lyndale Drive, Scotia Street, Wellington Crescent, and Wolseley Avenue. Closures are in effect 08:00 to 20:00 (8 a.m. to 8 p.m.) from Sunday preceding Victoria Day to Thanksgiving Day Monday, inclusive, and include all Sundays and statuatory holidays between these two dates, regardless of weather. Cyclist are reminded to use caution and continue to follow the rules of the road. The Winnipeg Trails Association is a coalition of volunteer trail builders and trail users who are focused on accelerating trail development and connectivity in Winnipeg. Visit their website. If you enjoy Winnipeg's trails, you might also be interested in the Trans Canada Trail. The Trans Canada Trail is a 18,000 kilometer recreational corridor that makes its way through Winnipeg as well as every Province and territory in Canada, linking 800 communities along its route. When completed, this will be the longest trail of its kind in the world, connecting our regions, our three oceans and our people in a new way for generations to come. Here is a searchable map for locating the area of this trail closest to you. To learn about the best walks in the city and surrounding parks, read Winnipeg Walks by Prairie Pathfinders. An illustrated guide with full colour detailed maps and photographs, this book can be found in most Winnipeg book stores. You can also order this book by visiting the Prairie Pathfinders web site. Stay to the right and watch for others. Do not use motorized vehicles on trails. Show respect and protect our natural resources. Understand that trails are prone to seasonal flooding and freezing. If you notice a trail/pathway light burnt out, broken or missing, please contact 311.